Jim created his own method of performing puppets specific to the television medium, discarding the puppet theater used by his predecessors like Burr Tillstrom and adding television monitors to use as his proscenium. With his soft, expressive puppets, Jim figured out the best method for presenting puppets on camera, making them seem alive and endearing them to audiences across the airwaves. After partnering with his future wife Jane who was also new to puppetry, Jim recruited other puppeteers to work with him like Jerry Juhl and Frank Oz. Jerry Nelson who joined Jim in 1965 was a hybrid, originally an actor and singer who then trained as a puppeteer with Bil Baird’s troupe. Jim recognized that he would have to train any new performer in his distinctive method whether they had puppetry experience or not and cast a wider net as he expanded his performing team. In 1970, Jim and Jane hosted a workshop to find more talent to support the intense shooting schedule for Sesame Street and to populate his television special The Great Santa Claus Switch. This involved advertising for both actors and puppeteers and having them come together for a training workshop. Over the course of several days, the group would be whittled down to those considered by Jim and Jane to have the most promise. That first workshop netted a young actress, Fran Brill, who continues, 43 years later, to perform on Sesame Street, and a young puppeteer, Richard Hunt, who would go on to create such memorable characters as Scooter, Don Music and Junior Gorg. Jim and his company continued with this recruiting method in the ensuing years, usually when he was about to start a new project, uncovering a host of talent. The 1975 workshop would have been in anticipation of the Muppet segments on Saturday Night Live which would premiere that fall and Jim’s expectation of landing a Muppet Show series which did go into production the following January. 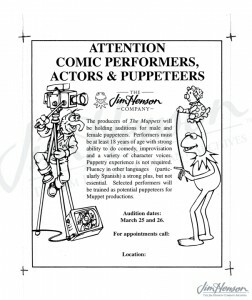 In the early 1990s, with Brian Henson at the helm, Jim Henson Productions hosted several multi-day workshops. Looking ahead toward The Secret Life of Toys which would start shooting in Germany in July 1993, Jerry Nelson helped lead a workshop that May. See him in action on May 26, 1993. Other workshops held in the early 1990s intended to diversify the talent pool by adding more women uncovered Stephanie D’Abruzzo and Leslie Carrara who both continue to work regularly on Sesame Street and other Henson projects. Learn about Fran Brill’s first encounter with Jim Henson and a 1987 workshop held in the UK. 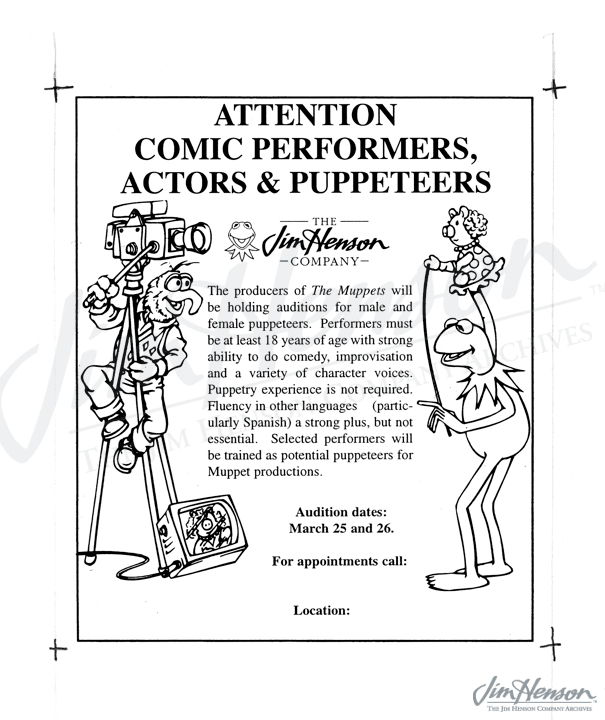 Advertisement for a Henson Company puppeteers audition workshop held in 1999. Gonzo and Kermit are demonstrating the Henson technique. This entry was posted in 05-May '75, 1975 and tagged Brian Henson, Burr Tillstrom, Fran Brill, Frank Oz, Jane Henson, Jerry Juhl, Jerry Nelson, Leslie Carrara, puppeteers, puppets, Richard Hunt, Sesame Street, Stephanie D’Abruzzo, The Great Santa Claus Switch, The Secret Life of Toys. Bookmark the permalink.